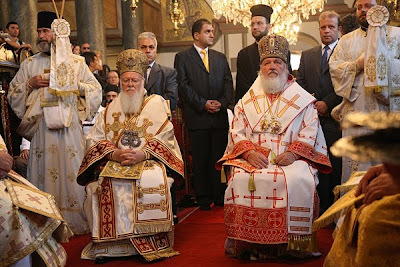 On August 4, 2009, a website posted an article presenting some of the recent developments taking place at the Moscow Patriarchate. Specifically, the Holy Synod of the Patriarchate of Moscow had begun reevaluating the ecclesiastical rank of the Orthodox Churches. According to Archpriest Maxim Kozlof, a member of the committee entrusted with this task, the Patriarchate of Moscow is considered a Church of the pentarchy, that is, of the five Churches of ancient Christendom. He also claims that by virtue of its magnitude, the Patriarchate of Moscow maintains such a status. He also declares that the Patriarchate of Moscow has extended its jurisdiction across numerous countries. After reading these comments, Fr. Makarios Griniezakis, a professor of theology and ethics at the Theological Academy of Heraklion in Crete, responded with a different perspective. In what follows, Fr. Makarios frames the claims made by Fr. Maxim in their proper historical, canonical, and ecclesiological setting. Fr. Makarios Griniezakis is an Archimandrite of the Ecumenical Throne; he is also the official preacher of the Archdiocese of Crete, and the director of the Archdiocese's radio station. 1. The fact that an Orthodox Patriarchate has yet to clarify in its conscience who is the First of Orthodoxy incites sadness. During their Synaxis this past October, the Primates of the Orthodox Church signed an official declaration that reemphasized who has the first place in Orthodoxy. We are troubled, however, that only a few months after this historic moment a committee is formed to reevaluate the ranking amongst Orthodox Churches. We remind the reader that the Primates, including the Patriarch of Russia, stated that they gathered "at the invitation and under the presidency of the First among us, Ecumenical Patriarch Bartholomew." If this statement is not sufficient, then our faithful brothers in Russia should refer to the Patriarchal Tome of 1589, which granted to them the Patriarchal Status. In the pages of this document they will discover exactly who signed the Tome, and thus realize who holds the eminent position in Orthodoxy. 2. To question issues that have been settled by Ecumenical Councils and established for centuries is quite dangerous. We speak in terms of "danger" because even a cursory study of history shows us that every heresy, schism and ecclesiastical division stemmed from personal ambition and egotism, only later to be robed in the mantle of dogmatic diversity. Arius, Dioscorus, Nestorius, Apollinarius, and Marcion, were pious and religious; however, they also were men who had tremendous egos and lacked ecclesiastical ethos. If they truly believed in God, if they were obedient to their bishops, if they respected the canons of the Church, and if they recognized the authenticity of the Holy Synods, then they would not have reached the point where they created division in the unified Body of Christ. Consequently, it is not enough for us to uphold the dogma of the Fathers in isolation--even the "old-calendarists" do this. We must also maintain the ethos of the Fathers, which helps to secure the unity of the Church. 3. When we speak about ecclesiastical ethos, we certainly do not identify with the logic based on size and figures. If we did, we would give the impression that we were economists, sociologists, and politicians. In the life of the Church, and especially in our spiritual lives--which the Church of Russia has much fruit to offer--two plus two does not always equal four. When we emphasize our vastness and point to statistical demonstrations, it means that we are not shepherds, but rather operatives of power, exploiting the administrative and spiritual authority that springs forth from our position. Â This is even more so the case when we put forth such efforts to earn the praise of the world and acquire the primary position in Orthodoxy. Given our current condition, those who participate in the administration of the Church must consider that their role is not to compete on stage with Stalin and Hitler. They are called to enter that sacred space where Church Fathers such as Basil the Great, Saint Gregory of Nyssa, Saint Gregory the Theologian, and Saint John Chrysostom live, and to be inspired by them. This is what we mean when we pronounce, "we who follow the fathers," especially since the patristic era has not ended. Every moment in time has the potential of becoming patristic if it secures and protects the Orthodox ecclesiological criteria for responding to prevalent problems and concerns. This is lost when we follow the philosophy and logic of the world, of arithmetic, of expediency, and of statistics and consequences. 4. It has been noted that, "the place of the Patriarchate of Moscow in the pentarchy of the ancient Patriarchates is very significant." It seems that some have still not realized that which is quite obvious, that is, that the Patriarchate of Moscow has never been a member of the pentarchy of the ancient Patriarchates. The pentarchy is comprised of Old Rome, New Rome (Constantinople) and the Patriarchates of Alexandria, Antioch, and Jerusalem. Not only was Moscow never considered a member of the pentarchy, but also there are no ecclesiastical or canonical texts that designate Moscow as the replacement or substitute for Old Rome. This is made clear when we look at some of the central moments in church history: the schism with Old Rome occurred on 1054 during the reign of Michael Kerularios, while Russia was elevated to the status of a Patriarchate in 1589, under Patriarch Jeremiah II. If there was ever a pressing need to replace Old Rome this would have occurred immediately after the schism (1054), and not five centuries later, when Russia was elevated to a Patriarchate. 5. It is also noted "that after the fall of Rome, the Patriarchate of Moscow acquired a seat amongst the five most significant Churches, and extends its jurisdiction over a series of countries." At this point we must emphasize that the 28th Canon of the Fourth Ecumenical Council grants only to the Church of Constantinople the jurisdictional oversight of the "barbaric lands." The extension of the Patriarch of Russia's jurisdiction across lands outside its ecclesiastical borders is uncanonical and a violation of Church order. This is the case when other Primates act similarly. Local Churches would have been able to extend into lands beyond their established ecclesiastical border if the canon referred to ethnicities ("barbarians") instead of geographical regions ("barabaric lands"). If this were the case we would have been able to say, for example, that the Romanian Patriarch is the spiritual leader of the Romanian people across the world, or that the Russian Patriarch is the leader of every Russian. However, the 28th Canon is unambiguous and mentions geographical jurisdictions and not ethnicities. Every Orthodox Church has a specific geographical border. Constantinople, however, maintains the license to extend throughout the Ecoumene, except, of course, into those areas under the canonical jurisdiction of other autocephalous or synodal Orthodox Churches. The present ecclesiological circumstances are accepted through ekonomia. After all, it is not ideal to have five Archbishops of America, or to have multiple ecclesiastical jurisdictions in a single European country. We should not forget, however, that our compliance with the current state of affairs through ekonomia should not become an occasion for boastful arrogance and deviation from canonical tradition. Moreover, the uncanonical extension of a Church's jurisdiction should not be viewed as a strict execution of canon law, nor should it be perceived as an a priori right that every Primate enjoys because of their canonical jurisdiction over a specified ecclesiastical geographic region. The thoughts that we have shared express a much deeper problem concerning what is often said about primacy in the Orthodox Church, about the idea of a "third Rome," about ecclesiastical rank, etc. These ideas would not be taken seriously had some random laymen or clergymen issued them. It is disturbing, however, when an official Church arbitrarily creates a committee (according to Fr. Maxim's comments) to evaluate matters that have already been resolved; to decide on those issues for which the Church has already decided. We would expect a Church such as Russia, which has undergone trials and tribulations, to have a completely different way of thinking. We would expect to see the Church of Russia rely more on faith than on logic, on miracles rather than facts and figures. It is clear from the discussion that the Ecumenical Patriarchate will certainly not lose the position of primacy that it maintains; the ranking of the Orthodox Churches will not change; and the committee in question--or any other committee that is formed--will not institute rebellious changes in the Orthodox Church. We owe it to the faithful to always speak the truth so that they may hear a different perspective, and in order to avoid stirring false impressions in them. It is important not to forget that truth abides. The truth will release us from our parochial attitude and self-love; the truth will liberate us from spitefulness and our egos; the truth will allow us to move beyond feelings that instigate internal quarrels and erect narcissistic partitions. 'The truth shall set us free.' Irrespective of who we are, as members of the Church we have a constant and sacred duty to actively defend the truth.